Lakeside is a track located in Queensland, Australia. 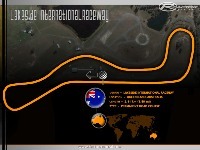 The circuit was opened in the 60's and continued to be a major motorsport venue in Australia until the early 90's. It was once a part of the V8 Supercar series. Unfortunately the track was sold to the local council and shut down for a long time due to noise complaints from nearby residents. The V8's moved to Queensland Raceway and Lakeside has since deteriorated. Recently the track has been reopened thanks to some loyal fans of the circuit and now holds club events. The latest version of this track aims to give the circuit its current day club feel. 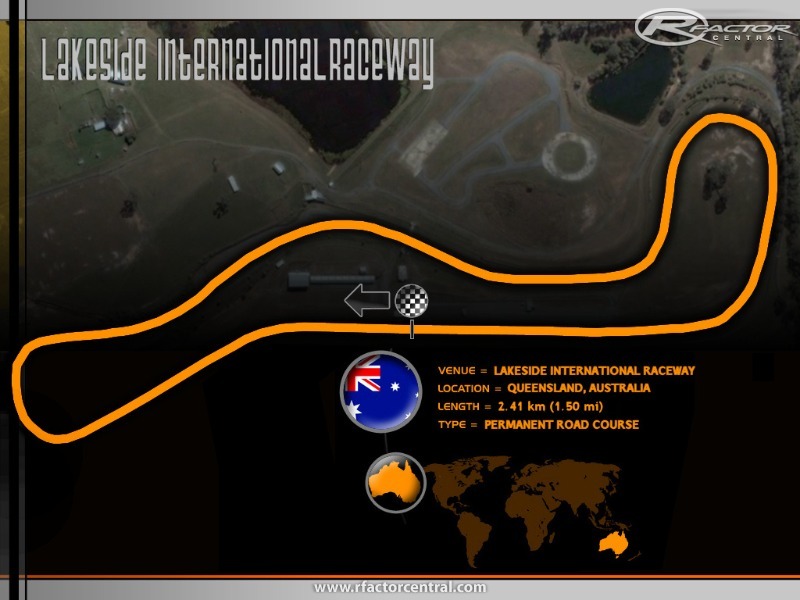 "The latest from MadCowie and Robert Hunter, with some help by Jim Pearson, is Lakeside, a real-life road course in Australia. The (real) track was built in 1961 and was used in the Tasman Series throughout the late '60s - several F1 drivers from the period competed there, making this a required track for those of you who are into the realism thing. That, and the track is just plain great! Go download the sucker already." New textures have been added. Mostly grass, track, curbing and signage were updated. I have used higher resolution textures where I can and all signs represent current day signage at the track. The main grandstand and bridge on the main straight have been removed. They never existed in real life. The control tower and flag marshal platform have also been removed. These were removed because they do not exist in those locations nor represent the actual control tower or flag platform very well. It was more realistic without them. The smoke and dust effects added in version 2 have been removed as they caused massive FPS hits. Smoke is still present in small amounts. The FPS performance was the biggest complaint among people who downloaded version 2. Not really a bug, but as with Version 2, there are minimal shadows. I turned on the shadows for some objects while editing the track but they did not add anything spectacular to the overall look so I turned them off again. Most cast shadows were not seen from the road surface anyway so it was rather pointless turning them on. 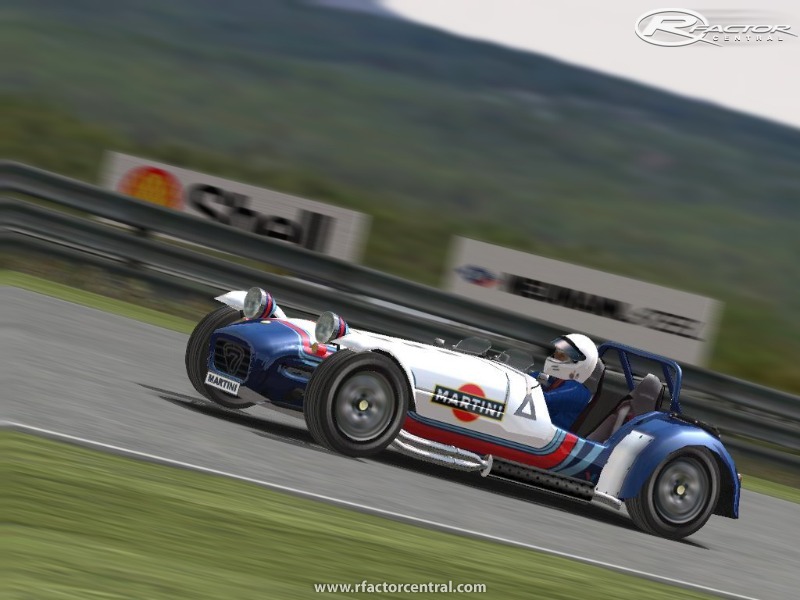 Thanks to Bud Lucas and Andy55 for converting this track to rFactor and giving me permission to release this update. It is loads of fun in almost any car. Thanks to Madcowie for creating the original! There are currently no setups for Lakeside International. Add a Setup. Does this version show the track as it was in the 60's with the earth bank at Hungry? 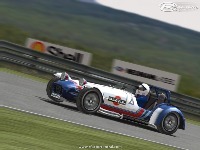 If so would love to have it for rFactor but the links are dead. I havent seen a track this beutiful. Can't believe I missed this, I have loved the other versions! Thanks to the entire Team!!! !